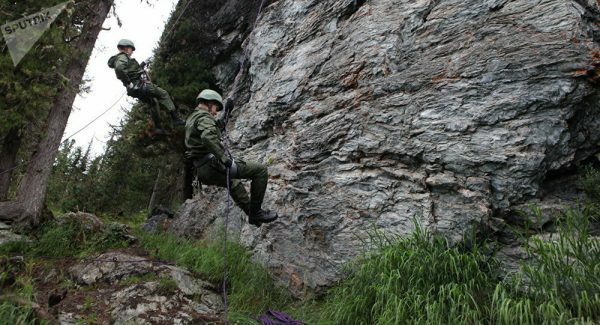 Chinese military officers took a training course provided by the Russian Special Forces together with a Siberian community of Old Believers, who helped navigate them treacherous Siberian terrain and taught them important survival skills. Chinese troops were transferred on helicopters to the Ergaki training camp in the foothills of the Western Sayan Mountains and received Russian equipment. After that, they landed in the wild taiga, where there is no mobile phone reception or other modern conveniences and the ground is covered with snow for about nine months of the year. The local community of Old Believers, followers of a Christian religious denomination that split from the Russian Orthodox Church in the 17th century, demonstrated basic survival skills in the wild to the guests from China, Colonel Yaroslav Roschupkin, the assistant commander of the Central Military District told Sputnik. “Most of all, the Chinese soldiers enjoyed fishing with a handmade tackle — they even caught several burbot fishes in a taiga river,” he said. About 700 fighters annually train on the grounds of the Ergaki center located south of Krasnoyarsk region. Local Old Believers have helped military instructors with survival courses since 2015. “The Old Believers of South Siberia are very skillful pathfinders and hunters. They live in isolation, passing their ancestors’ customs from one generation to another for more than three centuries,” Roschupkin explained. Strangers are not invited in their homes; Old Believers are also very reticent to speak about their religious rites. “They are selective in what they eat and drink: meat of wild animals with paws like hares or bears is forbidden, while consumption of cloven-hooved animals is allowed. Fowl and fish, nuts and berries are very popular on their menu,” the colonel added. Just recently some Old Believers mastered mobile communications and the internet. “However, there are some families living in the headwaters of the Maly Yenisey river, which remains closed to visitors, who do not recognize any innovations of modern life,” Roschupkin said.